(b) Disconnect the vacuum hose from the throttle body. (c) Disconnect the 2 water by-pass hoses. (d) Remove the 4 bolts, fuel pipe support and throttle body. 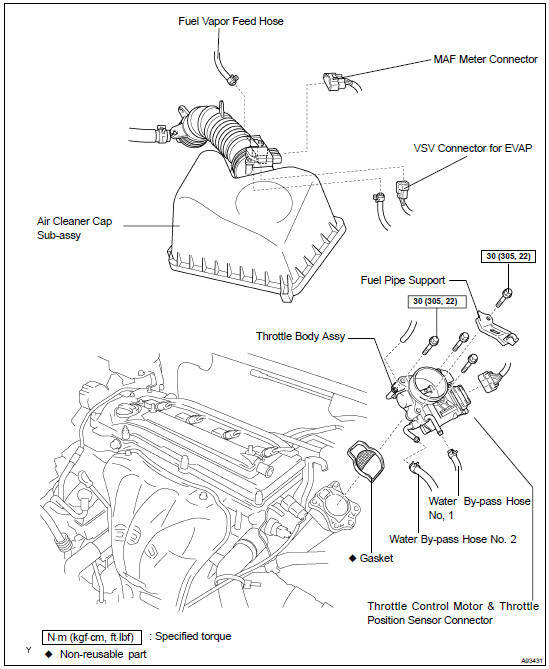 (a) Install a new gasket to the intake manifold, as shown in the illustration. (b) Install the throttle body and fuel pipe support with the 4 bolts. Torque: 30 NVm (305 kgfVcm, 22 ftVlbf) (c) Connect the 2 water by-pass hoses to the throttle body. (d) Connect the throttle control motor & throttle position sensor connector. (e) Connect the vacuum hose to the throttle body.